It’s a good day when you get to see two touring exhibits that are situated across the hall from one another at a major national museum. My good day came recently when I visited the Art Institute of Chicago with my two young children. I had lured them to the door with promises of cold Sprite packaged in sleek aerodynamic bottles. Damp with the heat of an August morning spent exploring Maggie Daley Park, they were captive to my persuasion. 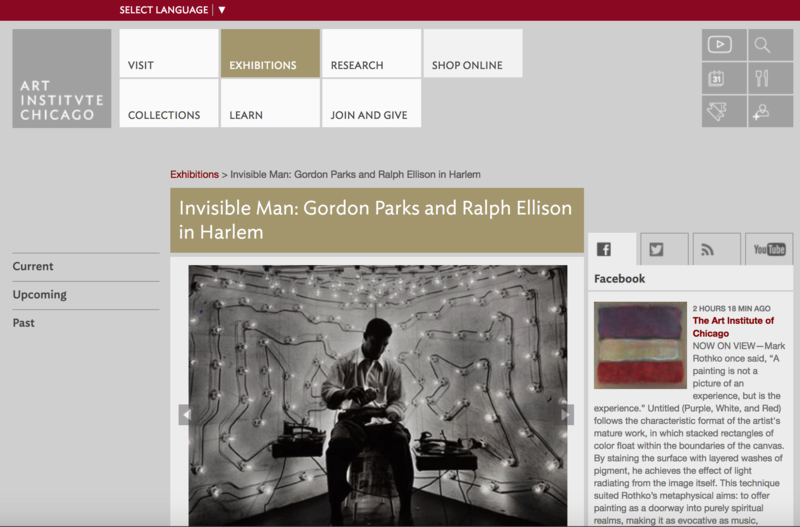 And with the crossing of a pedestrian bridge, we arrived in the new wing: “Invisible Man: Gordon Parks and Ralph Ellison in Harlem” on our left, “America After the Fall: painting in the 1930s” on our right. We gravitated left. When race is pictured historically, it often is removed from leftist radicalism. (Ellison’s novel Invisible Man is about Harlem in the 1930s, a decade when even middle of the road intellectuals were at their most socialist.) Likewise, when the “American” is imagined, it is at a distance from the mobility of artistic lives, influences and historical factors, including the circuits of Soviet communism (mentioned, briefly, in a sign about “industry and labor” in “After the Fall”). Rather than critique, I want to meditate on that slip of land between these two shows, their connective tissues, the soft spoken, what Ellison might call “lower frequencies” echoing in those AIC halls. As scholars Barbara Foley and Brent Edwards have reminded us, when Ralph Ellison began the project of Invisible Man in 1945 he conceived of the project as a black proletarian one. Over the next seven years, Ellison turned away from his earlier commitments to communism and became increasingly conservative in the milieu of a repressive Cold War climate. Dismayed by the hypocrisies he witnessed in party politics and the dogmatic demands of socialist realism, Ellison took up more experimental aesthetic projects and turned to nineteenth century writers, especially Fyodor Dostoevsky, for inspiration. But it would be an overstatement to say he abandoned the roots of internationalism altogether. As evidenced in the AIC exhibit, and in the work on which the exhibit is based--Ellison’s essays for “Harlem is Nowhere” (a collaborative project with Parks from 1947) and “A Man Becomes Invisible” (partially published in LIFE in 1952)--his meditations on poverty and race are infused with Lenin and Marx. For example, Ellison writes, “Individual failures when taken as proof of inferiority of all Negroes, injure entire group as vitally as man who has been struck by car.” And, similarly, to accompany Parks’ photograph of a Harlem shop window, Ellison charts the debasements of consumer capitalism: “Religion and toilet paper, dream books and bobby-pins, saints and exotic figurines, deodorants and incense, piggy banks and belly dancers—the values of a civilization reflected ironically in this Harlem store window.” A laundry list juxtaposing necessity and desperation indexes the mood of deprivation that pervades these Harlem scenes. Although Ellison may have turned towards psychology and a more European (and pre-Soviet) inspired modernism, other black artists and intellectuals sought to keep alive a hope that culture could transform perception by offering alternatives to capitalism through an anti-colonial world imaginary that foregrounded race, class and gender equality. Langston Hughes was the best known of these figures. Hughes spent nearly two years traveling across Russia and Soviet Central Asia in the early 1930s. He recorded these visits in his memoir I Wonder as I Wander (1956). But less edited and more socialist versions of these memories appeared in essays he published earlier in such unlikely places as Woman’s Home Companion, Theater Arts, and the Soviet literary magazine Internatsionalnaia literatura (International Literature). Now fairly well known, Hughes’s championing of what he reported as the Soviet system of racial, class and gender equality was connected to his fascination with the artistic innovations of the Soviet avant-garde. Hughes admired the revolutionary poetics of Vladimir Mayakovsky, and later translated Mayakovsky along with Boris Pasternak (as well as French poets Louis Aragon, whom he met in Moscow, and Jacques Roumain; Spanish poet Frederico Garcia Lorca; and Cuban Nicolas Guillen). As a black writer attempting to establish his authorial voice in a Western canon, Hughes was inspired by the Soviet project—as an artistic and political endeavor. Hughes sought to use the inspiration (and the cautionary tales) of linking vanguard politics and aesthetics to explore the revolutionary potential of Comintern notions for his own purposes. Hughes did not travel to Moscow alone, and his companions included Louise Thompson, Homer Smith, Mildred Jones, Wayland Rudd, and Dorothy West among others. Dorothy West, best known as the Harlem Renaissance author of The Living is Easy, wrote three columns for the short lived magazine Challenge (which she founded) called “Room In Red Square,” “An Adventure in Moscow,” and “Russian Correspondence.” Smith reported from Moscow under the pseudonym Chatwood Hall for the Baltimore Afro-American. Mildred Jones was an art student, and Wayland Rudd was an actor who stayed in Russia and became a well-known film personality. Louise Thompson was the mastermind behind the group trip, organized around the premise of making an original film to be called Black and White, funded by the international Meshchrabpom film company and directed by Karl Junghaus. Due to extenuating circumstances (including the construction of a major dam, formal diplomatic recognition of the USSR by the U.S., and not the poor quality of the script, as Steven Lee has documented for us in his elegant new book The Ethnic Avant Garde), the film never came to fruition. But what did blossom from these Soviet encounters were black, white, and brown interactions around politics and aesthetics that continue to circle back to Moscow as a key alternative nodal point in the matrix of American modernism. A reconsideration of these interactions has begun to create a lively subfield in modernist studies. In addition to Steven Lee, Ryan Kernan has written persuasively about Hughes’s translations of Mayakovsky, and Evelyn Crawford has edited the correspondence between Hughes and Louise Thompson. Although he didn’t travel there, Ellison was equally caught up in this milieu of Soviet enthrallment. As Dorothy West almost breathlessly put it, “The word on everybody’s lips in the 1930s was Russia.” (Cherene Sherrard-Johnson’s excellent biography of West, Dorothy West’s Paradise: A Biography of Class and Color , documents her trip to Russia.) Implicitly the question asked about Russia was “where do you stand?” For Paul Robeson, the answer was clear. Although his brilliant memoir was not published until the 1950s, Here I Stand put front and center the historical importance of mobility to African American liberation. While the U.S. stood with segregation in the 1930s, the Soviet Union had passed a constitutional amendment banning racism. While he supported the verbal championing of anti-racism, Robeson was privately wary of Stalin’s tactics and he did not endorse him, nor his atrocities. At the same time, he refused to support what he and William Patterson and the Civil Rights Congress termed Black Genocide in their failed petition to the U.N. in 1951. Put in an impossible position, Robeson became a casualty of Cold War belligerence. But his enthusiasm for a reconstructed world in which culture promised to transform perception through an anti-colonial imaginary remained firm. Meanwhile, artists like Ben Shahn, Joe Jones, Alice Neel, and others in the U.S. were equally influenced by the Communist Party and socialist realism. (Joe Jones’s painting “Roustabouts” appears in “After the Fall,” as does Shahn’s “The Passion of Sacco and Vanzetti.” Alice Neel’s work is not represented, but she is mentioned, along with Jones, as a member of the Communist Party.) Many had met in Moscow in the late 1920s, or come into contact with those who had been there. Diego Rivera went to Russia in 1927 and lingered in Moscow to create murals for the headquarters of the Red Army Club. He hung out in Moscow with Vladimir Mayakovsky and Sergei Eisenstein, whose film Que Viva Mexico! hails from this Mexican/Soviet cross-pollenization. Later in 1934 at the First All-Union Writers Congress in Moscow well-known Russian writers, Maxim Gorky, Isaac Babel, Yuri Olesha, Boris Pasternak, and Korneii Chukovskii, were joined by an international audience and roster of speakers who included Louis Aragon, Andre Malraux, Rafael Alberti, Ernst Toller, Robert Gessner, and Lloyd Brown. It was at this Congress that Andrei Zhdanov announced the new aesthetic platform of “socialist realism” a practice of representational art meant to inspire proletarian freedom and a global revolution that was hero and future oriented. Favored practitioners not only met with some of the Black and White troupe when they were in Moscow (Mildred Jones apparently had a short meeting with the Soviet painter Alexander Deineika), but they also traveled to the U.S. In fact, Deneika was fascinated enough by African Americans that he specifically requested to spend time in Harlem, and drew some striking portraits and sketches of black dancers and musicians which were exhibited in Moscow in 1935 (see Christina Kiaer’s excellent essay in Russian Review, July 2016). In brief, the thirties were rich with interactions between Soviet and American artists who were among other things essaying to come up with new ways to picture race and a world that could refashion itself from the ruins of imperialism. The reverberations of these Soviet circuits were not uni-directional but had deep implications for Soviet artists as well. For example, while Hughes’s Black and White was never filmed, a short animated film of the same title (taken from the title of a poem by Mayakovsky) was made by Ivan Ivanov-Vano and Leonid Almarik in 1932. Through the stark depiction of a South American sugar plantation, the film links themes of racial injustice, violence, and working-class solidarity. In the short film (only minutes of it remain, six of which you can watch on YouTube), you see charcoal versions of black men suffering in fields, struggling in chains, and an electrocution that visually suggests the origins of the prison industrial complex. Towards the end of the clip, black bodies are suspended from electricity poles in renegade murder; later state torture through electrocution cements the collusion of industry and white supremacy. All the while the film showcases an overweight, cigar-smoking overseer who menaces his charges. One of the last images of the film is “LENIN” emblazoned over his tomb in Red Square. This is followed by frames that proclaim: “Workers of All Countries, and the Oppressed People of the World Unite” and as red banners stream across the screen, the first is held aloft by a black fist. The soundtrack of the film is the black spiritual “Sometimes I feel like a Motherless Child” sung by Robeson. What one feels missing between these exhibits, then, is attention to the proximity between them, the shared anxieties and hopes between “Invisible Man” and “After the Fall.” On the one hand we witness testimony to the fallibility of U.S. capitalism across a varied template of region and political persuasion, and on the other we witness the ruin of lives parsed through capitalism on a daily basis. Both bespeak artistic and political disruption. They are linked by a mood of agitation. And what one hears echoing in the space between them is not only my children begging to go home but the belief that art has a place in the reconfiguration of American perception and reality, and that for the U.S. this legacy may have undeniably Soviet routes.